Get the party started right with the best chicken wings you ever barbecued. As an appetizer, a game-day snack, or a tailgate treat, chicken wings are an American favorite—and a staple of any pitmaster’s repertoire. These days, some people bake their wings—which is a disgrace to this time-honored tailgate classic. Here you will learn how to make amazing, authentic chicken wings in just seven simple steps. Wings are comprised of three sections: the wing tip, the middle joint, and the drumette. When you buy chicken wings, chances are they come whole, You can barbecue your wings whole if you like, but most prefer the wings separated, which is easy to do. With a sharp knife, remove the pointed wing tip. This piece has very little meat on it, so discard it. Then with one cut between the joints, separate the middle joint from the drumette. There are two basic ways to season wings—with a wet marinade or a dry rub. Wings take nicely to marinades, which is a very popular way to season them. Once prepped, place your wings in resealable bag or a container and then add your favorite marinade. Let them soak for at least an hour prior to barbecuing. If dry rubbing, simply apply your favorite barbecue rub or dry seasoning to the raw chicken wings prior to barbecuing. Set up your coals in a two-zone configuration. Light your coals and pile them all onto one side of your BBQ, leaving the other side empty. You’ll sear the wings on the hot side, and let them finish cooking through on the cool side. Sear your chicken wings directly over the coals on the hot side of the BBQ. Sear the wings on all sides to get a nicely browned, crispy skin. Chicken skin burns quickly, particularly when the marinade or rub contains high amounts of sugar. So watch them closely and turn them often to prevent scorching. Finish on the cooler side. Once browned on all sides, move the wings over to the cool side of the BBQ to finish cooking through. Place the lid on the BBQ and let them cook until the wings reach a safe internal temperature of 74°C. An instant-read digital thermometer will come in handy for checking doneness. In general, the wings take 8 to 10 minutes to finish cooking through. 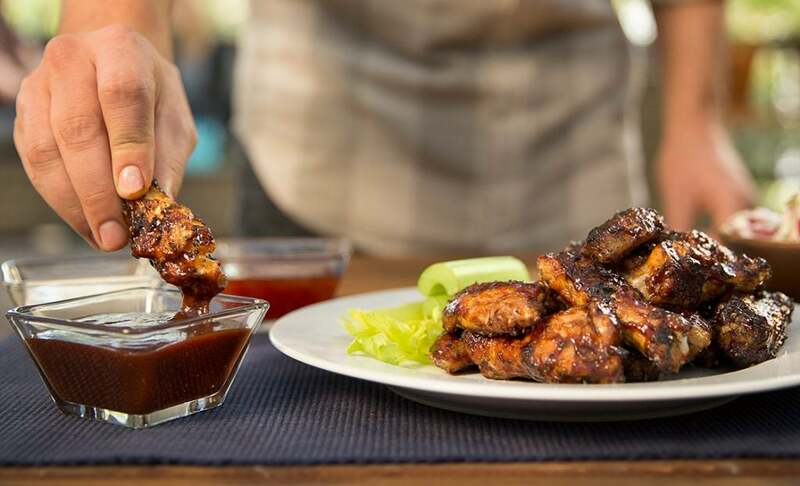 If you want to add a sauce or glaze to your wings, apply it during the last few minutes of cooking. Brush on your sauce or glaze, and put the lid back on to let the sauce heat up and caramelize on the wings. Most sweet sauces do contain a lot of sugars, so watch the wings closely to make sure the sauce does not char. Chicken wings are ready to serve right off the BBQ — no need to let them rest. You can pair them with the classic celery sticks and blue cheese dressing or with dipping sauces like barbecue sauce, ranch dressing, Asian sweet chili sauce, or any number of commercially available hot sauces. Avoid putting a thick, sweet sauce on raw wings before barbecuing. The sugars in the sauce will burn before the meat inside has a chance to cook through. The result will be a wing with an incinerated exterior and a raw interior. Fire up your wings with America’s favorite—Kingsford® Original Charcoal.